Yes, yes, the yummy photo is to tide you over as I go off on a tangent. I'll get to the food in a bit, but we're still discussing the wedding you see. We are? Certainly, have you so quickly forgotten the wedding ceremony and reception? And that for several weeks I'm entertaining my cousin and her friend who are visiting from Norway? This part is important as it characterizes the next dozen or so postings. My cousin called to invite me out for lunch before he headed back up to Portland. Now, I've mentioned my many cousins before but they're all on my dad's side. This cousin and his family is pretty much all that's in the U.S. on my mom's side. And my Norwegian cousin is from my mom's side too. So, of course, we had to meet up with him. Anyway, this was the second time my Norwegian cousin has come out to visit me. Her visits are usually filled with requests to try all the ethnic food she can't get or is vastly more expensive in Norway, and things that she picks up about American culture from television and movies. The first time she came, she wanted to order Chinese food with the traditional take-out boxes (Seinfeld) and a vanilla coke (Pulp Fiction) and to eat at a kitschy 50's-style diner (Johnny Rockets). This time around she requested cannoli (Sopranos perhaps?) and more ethnic food. Since my Portland cousin was already hanging out in Little Saigon, I suggested Brodard Restaurant in Garden Grove. 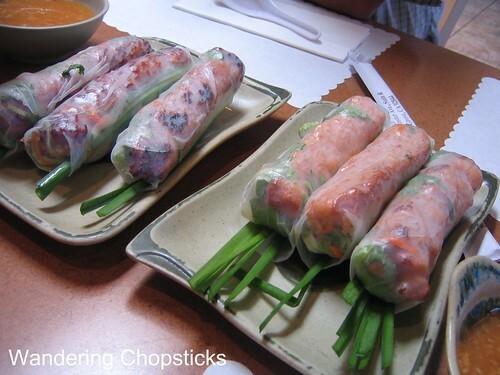 Brodard is the place to go in Little Saigon for Nem Nuong and Nem Nuong Cuon (Vietnamese Grilled Pork Patty and Vietnamese Grilled Pork Patty Salad Rolls). 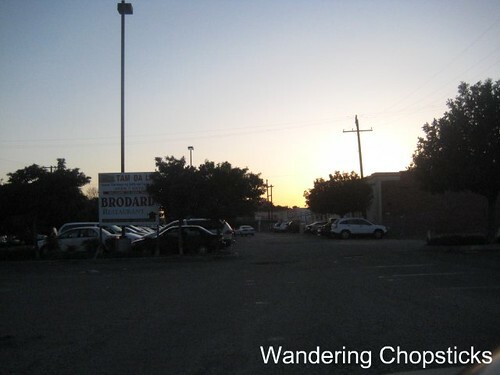 It's current location is on the back side of the Mall of Fortune, behind the 99 Cents Only store, enter from Brookhurst Street and not Westminster Avenue like its address indicates. Before that, it was located in the now-defunct New Saigon Mall that was far, far, far in the back of the Asian Village Mall past the parking lot, behind the supermarket, and beyond the Cultural Court. Even when all the other tenants of the New Saigon Mall had closed shop and left because the location was so inaccessible from the rest of the Bolsa Avenue traffic, Brodard kept people coming. And when it moved to its current location, people followed. I've mentioned Brodard before in my Nem Nuong Ninh Hoa post discussing nem nuong cuon comparisons. And here you can see that it's become quite an assembly line to make the rolls because virtually everyone comes here for this. 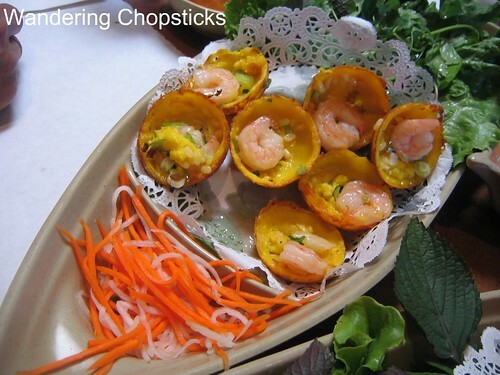 The owners are from Nha Trang, near Ninh Hoa in the South Central coast of Vietnam where nem nuong originated, so they know what they're about. On the left is the $4.50 for 3 rolls nem nuong cuon and on the right is the $5.25 for 3 rolls chao tom cuon (Vietnamese shrimp paste salad rolls). It's the dipping sauce that makes Brodard stand out. Other places have tried to replicate it, but none can equal this rich, brothy, meaty sauce. I've been in the restaurant when they've literally had buckets of honey delivered so I know that goes into it. And I can detect a hint of honey in the taste. I think there's also egg drop, broth, meat bits. Really, it's almost like a soup, it's so thick. My cousin ordered the flan. Although it looked nice, and was served the way my mommy does it with crushed ice on top, it was from a mix. 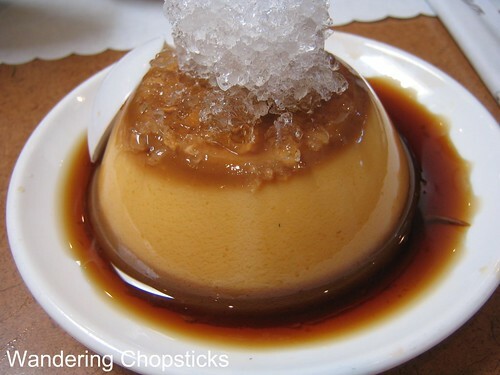 A good mix, but still lacked that freshness of real flan. I mean really, it's just eggs, milk, and sugar. But I guess for $1.50, I shouldn't have expected the real deal. 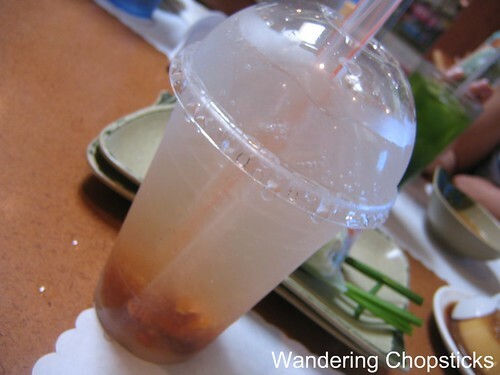 My $2.50 Soda Xi Muoi (Vietnamese Preserved Plum Drink) was nice and generous. My cousin ordered $1.50 Rau Ma (Vietnamese Pennywort Drink). It's very refreshing during the hot summer months. 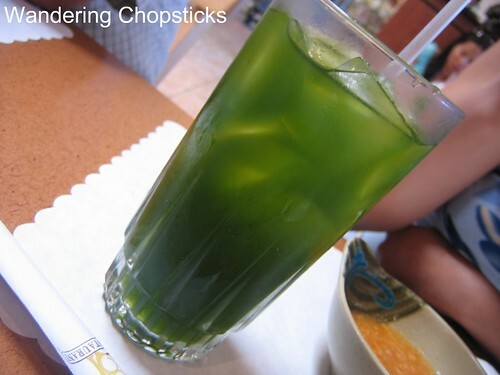 I mentioned this drink before when I ordered it at dim sum and other food bloggers had wanted to try it as well. 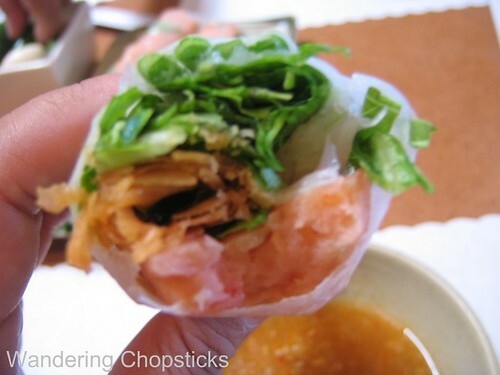 I also love Brodard's Banh Tom Co Ngu (Vietnamese Shrimp and Sweet Potato Tempura). 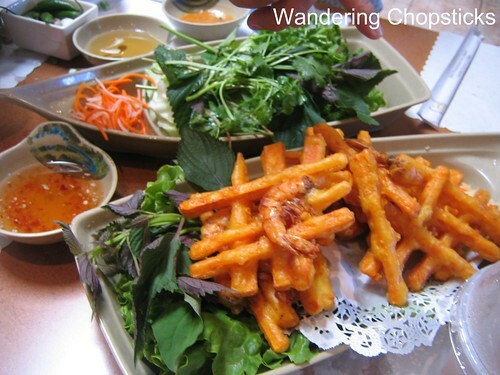 This $5.95 dish comes with herbs for you to break off a piece of the sweet potato and lay it in a bed of lettuce with assorted herbs and pickles, and dip it into the fish sauce. Other restaurants slice the sweet potato much thinner, but I like the nice thick French fry-like sticks they do here. They also arrange each sweet potato so artfully don't they? The $5.75 banh xeo (Vietnamese sizzling savory crepes) was disappointing. I've never ordered this here before so I was expecting the smaller Central-style banh xeo I discussed in this post. Instead, this was Saigon-style wok-sized, turmeric-colored, heavy on the coconut milk, with an egg in the center that became runny when you cut into it. Aiyah! In a nice Central-style banh xeo, it's just one small quail egg so the yolk doesn't make a runny mess. We ended up eating around the edges but didn't finish this dish. My Portland cousin's friend, who also hails from our hometown, laughed when I said I preferred our style of banh xeo because other places can't replicate the crispy exterior and chewy interior. He explained it's achieved by grinding the rice grains into fresh flour. Most places use bagged flour. I guess that explains why I've never been satisfied with banh xeo at any restaurant outside of my hometown in Vietnam. We also ordered the $5.25 banh khot (Vietnamese luna rice cakes). (Huh! Never heard them referred to as this before.) These had a bit too much coconut milk and too little flour so they ended up tasting like mini-banh xeo. I much preferred the version at Vung Tau Restaurant in San Jose. Go to Brodard for the nem nuong or rather its dipping sauce. Their roasted Cornish game hen with rice is good. Their banh canh (sort of like Vietnamese crab and shrimp udon) is thick and hearty. I think they do best with their appetizers and grilled rice dishes, but the menu is extensive enough for you to experiment. If you want the more upscale version of their restaurant, there's always Brodard Chateau Vietnamese Cuisine - Garden Grove (Little Saigon. After lunch, Norwegian cousin wanted to go to the beach. For her, no vacation is complete without laying in the sun and getting a tan to prove that she's been on vacation. It was quite a lovely day as you can see for yourself. 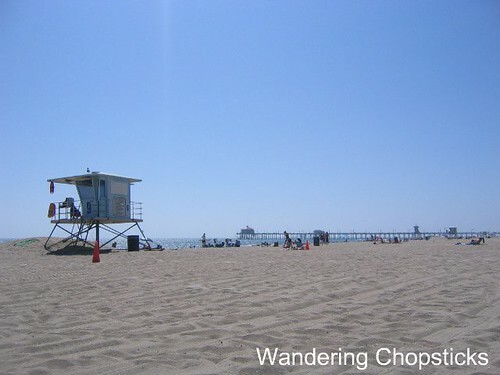 Huntington Beach was also our rendezvous point with my brother's college friends who had taken Norwegian cousin's friend to Hollywood while we met up with our Portland cousin. One of the guys had never been to California before (hence, the trip to Hollywood), the other was on a hunt for fresh jackfruit to bring back to Boston, and the third decided to skip his flight to Vegas to hang out with us. The day wasn't complete yet. After meeting up, we stopped off at C & C Express for some freshly squeezed sugarcane juice and my cousin ate a fetal duck egg. Then it was Vietnamese American Cajun-style cuisine at Rockin' Crawfish. 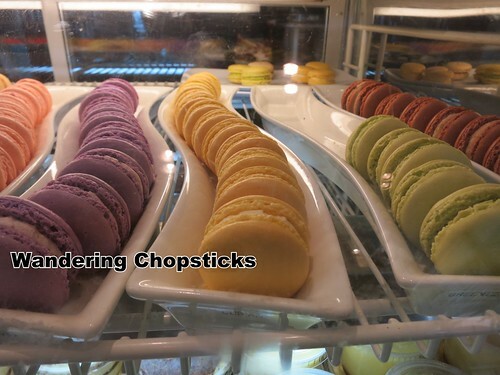 While I've largely stuck to these basics when dining on repeat visits to Brodard, I felt it was worthy of updating to tell you they now have durian macarons! Who else ate at Brodard? 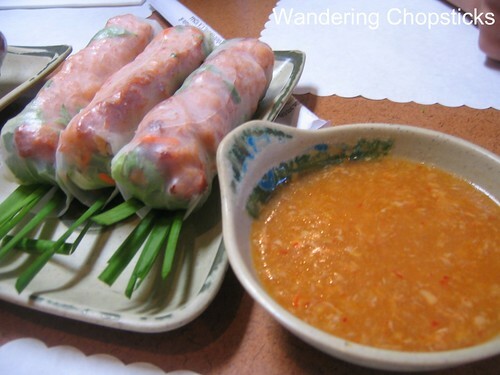 Elmo of Monster Munching says he goes here for the nem nuong cuon too. You're so lucky to have so many good restaurants near you. There are no good Asian restaurants in the inland empire. Well, I also haven't been looking that hard either. I think I need to go out and explore the IE more. Those little spring rolls look great, I wonder what's in the dipping sauce. Hey I was just there on Wednesday night! Being that I'm kinda ignorant on properly made banh xeo, I liked Brodards, but same as you I ate the crispy parts first and kinda left the mushy, wet center alone. Hi WC - As much as I enjoyed the really, really, hunger inducing photos and descriptions(I know what I'm having for lunch...). I really enjoyed the back-story. My guess is that the sauce you enjoyed (nuoc leo) contained pork liver. If so, lucky you. Here in Chicago, homecooks are the only ones to make it that way any more. Yes, you do. I've actually got a few places in the Inland Valley I need to post about. But you can check out my review of Pho Ha in Pomona, they're pretty good. 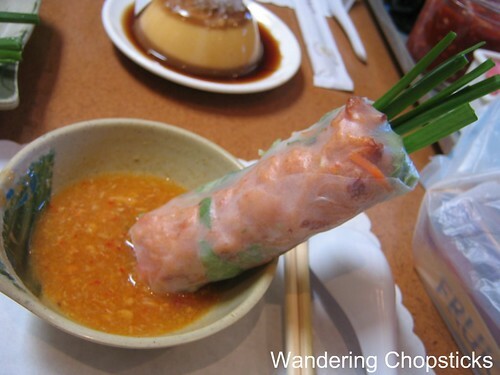 Nuoc leo is peanut dipping sauce. This wasn't peanutty. It was very meaty and brothy tasting. And liver is a new guess, but I really doubt it since I couldn't detect that at all. FYI - on the other side next to 99 cent - there is this small shop that makes really good banh tom co ngu and bun cha ha noi. I think it Hoa Minh, but the interior is a little fancy looking for a small shop. "Erik, Nuoc leo is peanut dipping sauce. This wasn't peanutty. It was very meaty and brothy tasting. And liver is a new guess, but I really doubt it since I couldn't detect that at all." I know well what nuoc leo is. Well enough, in fact, to know that formulations can vary wildly and can sometimes include liver. Please refer to books like "The Classic Cuisine of Vietnam," by Bach Ngo and Gloria Zimmerman (Barron's, 1979) and "Into The Vietnamese Kitchen," by Andrea Nguyen (Ten Speed Press, 2006) for only two such examples. The inclusion of liver and minced meat (usu. pork) is an ancient innovation which is often credited to Hue, in Central VN. And, to this day, Hue restaurants such as Banh Khoai Ben Do Con are famous for their pungent peanut/liver-based dipping sauces. Now, am I saying that the sauce you tried contained liver? No, I am not. But, not having tried it myself, I can tell you that it certainly *gives the appearance* of nuoc leo, and so your description of it's "meaty" character brought liver to mind almost immediately. Me and my buddies frequent this place and one of the things we always get is either their Goi Ga, shredded chicken salad, or Goi Bo, spicy beef salad. Either are enough to share between 4 people and both come with different sets of veggies. Are you sure on the name? I know my friend mentioned something on the other side but for the life of me, I'm remembering something else? But while we're on the subject of bun cha, since I know how much you like it, what's your favorite bun cha restaurant? I'm not sure why you're in such a tizzy over the definition of nuoc lkeo. But you said, "My guess is that the sauce you enjoyed (nuoc leo) contained pork liver." I'm simply saying I didn't taste it. 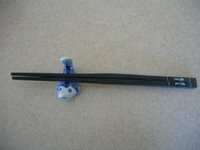 It could very well have contained liver, but not in a big enough quantity to make it discernible. Same goes for the taste of peanuts. As I said, I have no idea what is in their sauce. As for the matter of what constitutes nuoc leo, since you're not disagreeing with me that nuoc leo contains peanuts, I think I'm correct in describing nuoc leo as a peanut sauce. Sure there's variations, that happens with a lot of Vietnamese food. Cha ca is not the same in Hanoi as it is down South. 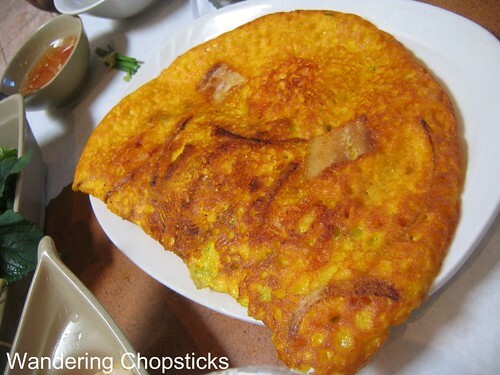 Banh xeo gets progressively larger the farther south you go. Pho is not the same in Hanoi as it is in Saigon. But since you want to trump out cookbooks to back up your statement that nuoc leo contains liver, it's just as easy for me to give alternate recipes in which liver plays no part. For instance, in Corinne Trang's "Authentic Vietnamese Cooking: Food from a Family Table (Simon and Schuster, 1999)," her nuoc leo, which she describes as peanut dipping sauce does not mention liver at all. 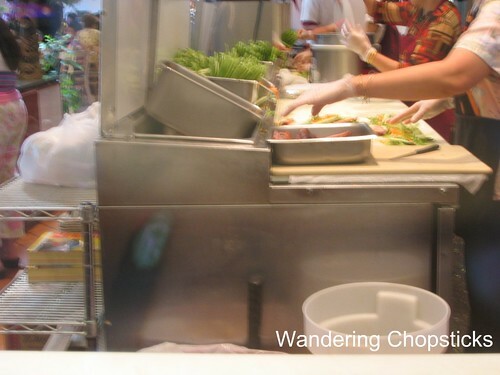 Or in Nicole Routhier's "The Foods of Vietnam" (Stewart, Tabori, and Chang, 1989, 1999), which won the 1989 IACP Best International Cookbook and Best Cookbook of the Year Awards, and again in "The Best of Nicole Routhier" (Stewart, Tabori, and Chang, 1996), her recipe for nuoc leo is also described as peanut dipping sauce and doesn't include liver either. I'm not sure why you're debating that the sauce may or may not contain liver or what it "appears" to be, when you yourself admit you've never eaten there. I'm really at a loss as to why you seem to think nuoc leo is so worthy of debate actually, but there you go. I never said nuoc leo doesn't or can't contain liver. I said I could neither taste peanut nor liver in their sauce. Thanks for the suggestions. I'll keep that in mind next time I dine here. I FINALLY gave this place a try last night, and i loved it! The flan is from a mix??? No wonder it wasn't rich... Where would you recommend for a Vietnamese flan fiend? No way! What a coincidence! That's so cruel of your mom. I want the secret recipe! 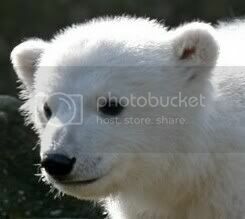 haha i just went to this place last week when i was down there.